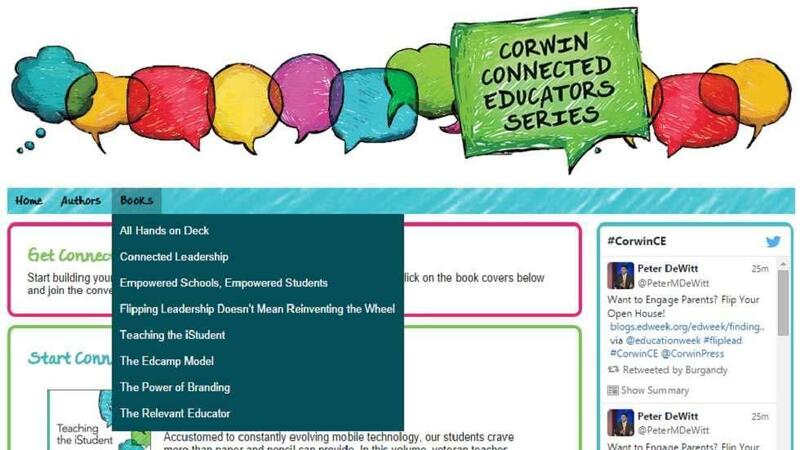 The Corwin Connected Educators Series is an amazing collection of eight books that unlock the greatest resource for every educator in the 21st century across the globe. This book series features short books of about 70 pages in both electronic and paper back formats. Connected Leadership: It’s Just a Click Away is a book by Spike Cook. In this book, author shares and writes to school leaders about how to write blogs, about PLNs to open digital box for parents and community. A book by Steven Anderson and Tom Whitby; the book explains how to successfully utilise social media to build PLN. This book is written by Pernille Ripp. In this book, author shares a number of methods for educators as well as school leaders, on how they can endow students and colleagues build a strong learning community. In this book Brad Curries shows one can connect with parents and communities using 21st century tools. "This is an incredibly practical book that provides insight on engaging school stakeholders. Brad has done a wonderful job of sharing success stories as it relates to the power of technology to connect schools with parents and community members. The ideas shared throughout the book can help strengthen a school's culture in order to promote the success of all students." "Great leaders are intentional about everything they do. Tony and Joe's message stresses the importance of being intentional in telling the great stories of schools. Focusing on the positive things happening in schools gives leaders more drive and has a tremendous impact on school culture. This book is a powerful resource for leaders looking to promote the positive things happening in their schools to the community." Flipping Leadership Doesn’t Mean Reinventing the Wheel is a book authored by Peter DeWitt. According to the author we can flip faculty meetings as well as other types of communication between parents and teachers. "Education is plagued by outdated leadership strategies and techniques that have long lost their luster. Peter DeWitt provides a fresh look at how leaders can make use of precious time while increasing the effectiveness of meetings and communications. His message is a call to action for leaders to jump on the train before it is toolate." In this volume, well-known author and veteran teacher Mark Barnes tells how teachers can utilise social media and mobile devices to make a win-win for learning and teaching. "As a former classroom teacher, Mark understands what is needed to engage students from the moment they walk into the classroom. In his new book, Mark offers his insight to make sure all teachers understand their students, and provides suggestions on how educators can maximize the potential of the iStudent." The Edcamp Model Powering Up Professional Learning joins educators to PD.